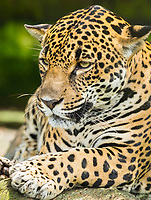 Jaguar images (Panthera onca) - stock photos & facts of the largest wild cat in the Americas. We have a unique and eye-catching display of jaguar photographs that any fan of wildlife can appreciate. Observe jaguars in the wild doing various activities such as swimming, caring for and playing with their cubs, stalking prey, and lounging in trees. Their intense eyes and their unique rosettes on their fur are enough to capture anyone’s attention. We are the source for any of your wildlife photographic needs. Jaguars are the only wild cat of the genus Panthera native to the Americas that is not extinct. Their most common coat color ranges from a deep tan to reddish-brown for most of their body, but their most characteristic trait are the dark rosettes scattered along their fur, which act as a camouflage in the spotted and fragmented light in their forest habitat. Its weight typically varies between 100-250 lbs, with its average length between 4-6 feet long. Jaguars are the largest native cat species to the Americas and the third largest in the world. Their life expectancy is between 12-15 years, although this can be prolonged 3-5 more years in captivity. Jaguars are apex predators. Like their fellow large cat the tiger, they enjoy swimming, but will mainly use this skill for catching prey that includes fish, turtles, and alligators. In addition, they eat a variety of land mammals, usually by waiting in trees and ambushing the animal as it walks by. These land mammals include sloths, anacondas, deer, peccaries, capybaras, tapirs, monkeys, and birds. They are solitary creatures and do not like to share their prey with fellow jaguars. To ensure that their prey will not be stolen from them, they will only consume prey after dragging it into the trees. Jaguars are considered a keystone species, as they play an important role in regulating prey population and stabilizing ecosystems. The jaguar’s present range stretches from the Southwestern U.S. and Mexico, through much of Central America, ending south in Paraguay and northern Argentina. They are particularly concentrated in the Amazon Basin. Jaguars operate in a variety of forested and open terrain, but they prefer tropical forests and swamps as their home. There are currently 15,000 jaguars left in the wild, and it is listed as Near Threatened on the IUCN Red List. The main reason for the decline of the jaguar population has been loss of habitat; however, poaching and the killing of jaguars by farmers in protection of their livestock has also been an issue in jaguar conservation. Passionate efforts to not only protect the jaguar but also its rainforest habitat continue today.